The New Zealand rabbit is a large rabbit routinely used as a meat and laboratory rabbit but also a popular pet and exhibition rabbit. New Zealand rabbits originate from America, not New Zealand. The New Zealand White first appeared in 1917 in America and was imported into the UK after the Second World War (1945). 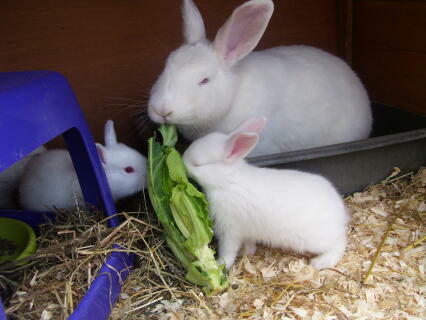 The New Zealand rabbit grows very quickly, perhaps the reason for its popularity as a meat rabbit. An adult rabbit can weigh up to 5.44kg (12lb) with a medium body, well-rounded haunches, short front legs and a bold head. The coat is usually dense but soft. As a large rabbit, the New Zealand may be less prone to nervousness however its weight might be off-putting for people that wish to handle the breed regularly. 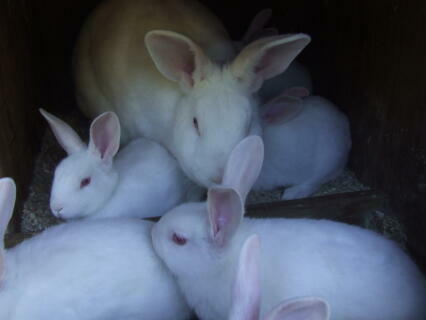 White, Black, Blue The New Zealand Red is a smaller rabbit than the New Zealand White, typically weighing 3.62kg (8lb). There are only 2 types of New Zealand, Show and Meat. 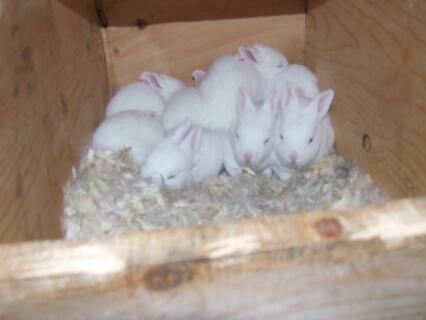 Meat rabbits grow faster and sturdier, many are true to standard while show rabbits have to be smaller to get into the show my 8 week old kits have to be shows as juniors. But that's the only difference, love this breed in all colours. i love my new zealand, she is super frienly to poeple and other rabbits, and she even won a trophie, i highly recomend this breed. I have only had 1 of these magnificent rabbits,a stunning New Zealand Blue.She came from Gloucester Cattle market and was already an adult and full grown when I got her. She was the easiest rabbit to handle(my thanks to her previous owner)and extremely docile and friendly.At the time I got her,my rabbits were all Netherland Dwarf x Polish,so getting such a large rabbit I was worried I would be out of my depth,she quickly put me at my ease.She was prone to scouring,so I only ever fed her on her pellets.I don't know if the breed as a whole are susceptible to this,or if it was just peculiar to her.The nicest doe I have ever owned.